Physicist Lawrence Krauss discusses how the universe could have naturally arisen from nothing. Theoretical physicist Lawrence Krauss has taken on plenty of edgy topics, ranging from evolution to the state of science policy, to quantum quackery, to the science of "Star Trek." But in his latest book, he takes on what might be the edgiest topic of all: how all the somethingness of our universe could have arisen from nothingness without divine intervention. The argument that God had to be the "unmoved mover," sparking the cosmos into existence, goes back to Aristotle and Thomas Aquinas. In his debates with theologians, "the question 'why is there something rather than nothing' always comes up as the one 'indefensible' issue that implies there must be a creator," Krauss told me over the weekend. "We've come so far, that addressing that question — or at least addressing similar questions — has become a part of science," said Krauss, who heads the Origins Project at Arizona State University. He addressed the question in a lecture that was videotaped at an Athiest Alliance International conference in 2009, and the video has been viewed more than a million times on YouTube since then. The video prompted Krauss to write his newly published book on the subject, "A Universe From Nothing." Why is there something rather than nothing? Krauss said that question implies a search for purpose that really doesn't mesh with scientific inquiry. "The 'why' question is never really a 'why' question ... really, when we say 'why,' we mean 'how,'" he told me. OK, so how can you get a cosmos from nothing? 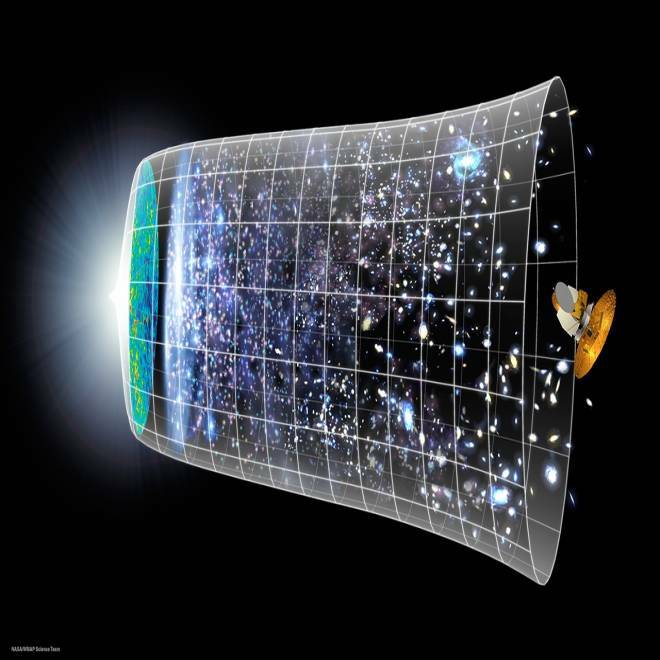 Krauss traces a series of discoveries building up from Einstein's general theory of relativity to the latest studies of dark energy, explaining how scientists have determined that empty space is seething with energy in the form of virtual particles. From the perspective of quantum physics, particles are popping into and out of existence all the time. The way Krauss and many other theorists see it, nothingness is so unstable that it has to give rise to something ... in our case, the universe as we know it. What's more, Krauss and his colleagues are coming around to the view that there could be a countless succession of big bangs, creating many universes with different parameters and laws of physics. Some of the universes in this multiverse fizzle back into nothingness immediately, while others — such as ours — hang around long enough to spawn galaxies and stars, planets and life. Scientists haven't yet figured out a way to test this hypothesis, but it would explain how we're lucky enough to live in a long-lasting universe: We just happened to win the prize of existence in a cosmic lottery. "Some people say, 'Well, that's just a cop-out,'" Krauss acknowledged. "But it's actually less of a cop-out than God." Krauss' book isn't the only one to claim that God's not needed for the creation of the universe. British physicist Stephen Hawking, a good friend of Krauss', made a similar point in his own most recent book, "The Grand Design." A key point in the argument is that the positive energy bound up in matter is balanced by negative gravitational-field energy. From the quantum perspective, the total energy of the universe is pretty much zero. Thus, the energy of "nothingness" is conserved, even when somethingness enters the picture. This idea of positive and negative energy balancing out at zero has sparked criticism from the creationist side of the fence, but Krauss said the concept fits with current cosmological theories. This graphic traces the evolution of the universe from the big bang (at left) to the present, based on data from the Wilkinson Microwave Anisotropy Probe (far right). So what gave rise to the big bang? Theoretical physicist Lawrence Krauss says addressing such questions "has become a part of science." "It sounds like a scam," he told me. "It isn't a scam. Once you allow gravity, the amazing thing is that you can start out with zero energy and end up with lots of stuff, and that stuff can have positive energy, as long as you counteract it with negative energy. Gravity allows energy to be negative. I liken it to the difference between a very savvy stockbroker and an embezzler. The savvy stockbroker will buy on margin, and buy more stuff than they actually have money to account for. But as long as the stock goes up and they sell it in the end, no one knows the difference and everyone's happy — whereas the embezzler takes the money and of course is discovered. The universe is more like the savvy stockbroker." In the ultra-long term, when all the galaxies have spread out in our expanding universe, and all the stars have died out, the positives and negatives cancel each other out, turning our universe back into the uniformity of empty space. "The 'somethingness' may be here for just a short time," Krauss said. For a lot of people, all this might sound positively soul-killing. Evolutionary biologist (and crusading atheist) Richard Dawkins says as much in his afterword to Krauss' book: "If you think that's bleak and cheerless, too bad. Reality doesn't owe us comfort." But Krauss said he doesn't intend the book to be a downer. "My goal is not to destroy religion, though in fact that would be an interesting side effect," he said. "It's not any more my goal than it was Charles Darwin's goal with his book ["On the Origin of Species"]. My goal is to use the hook of this fascinating question, whiich everyone asks, to motivate people to learn about the real universe." Krauss said a scientific perspective on the origins and the fate of the universe offers a valid alternative to the solace traditionally provided by religion. "A Universe From Nothing" aims to explain how something can come from nothingness in accord with the laws of physics. "Here are these remarkable laws of nature that have arisen and produced what you never would have expected, something much more interesting than any fairy tale," Krauss said. "We are the lucky beneficiaries of that, and we should enjoy the remarkable fact that we have a consciousness that can appreciate this remarkable universe. If it's a remarkable accident, how lucky are we to be a part of it! I do think you can create a 'theology' around this if you want." Krauss doesn't mean "theology" in the literal sense of the study of God's ways, of course, but rather in the sense of an attitude toward life and its meaning (or meaninglessness). What's your attitude? Feel free to weigh in with your comments below. Stephen Hawking says God's not needed. So?